A couple of weeks ago I stumbled across a fellow blogger who was looking for women who wanted to write for her blog tour: #fireworkpeople. Fast forward two weeks later and I have thought about that commitment exactly twice. The most recent of which was this morning when I realized today was my day! Well, crap. So as I sit here this morning trying to comfort a cranky, reflux-y five-week-old, twin toddlers and a preschooler run amuck, the housework stares at me mockingly, and I’m desperately trying to remember if there might have been any other deadlines I might have forgotten…I find myself battling with the everyday self-doubt, but on a higher level. I don’t have any epic words of empowerment to share. 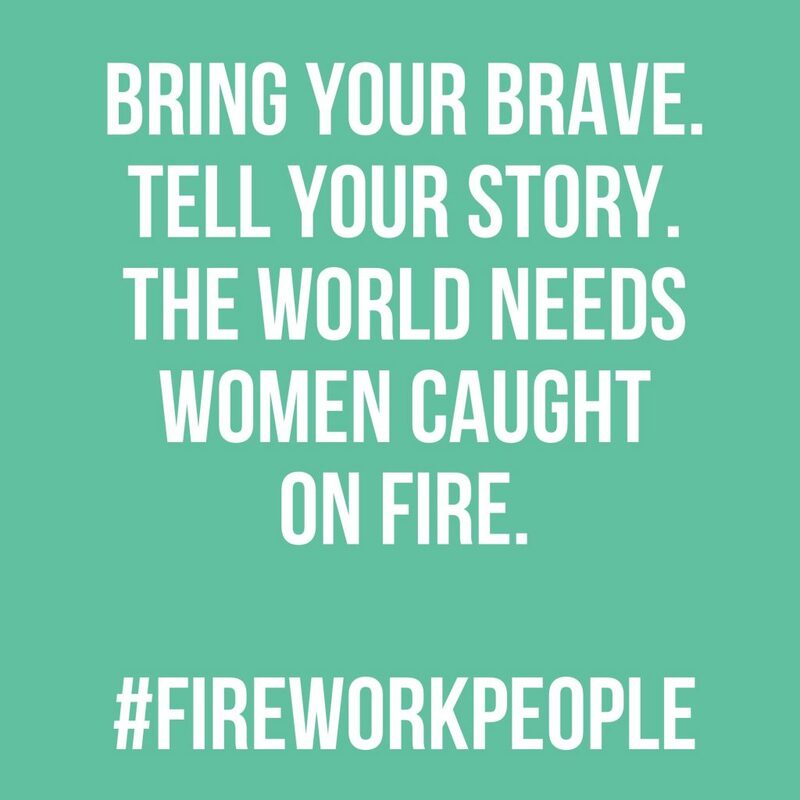 I don’t have a dream worthy of sharing for this #fireworkpeople project. No, seriously, most days, my biggest dream is to finish my cup of coffee before it gets cold…for the fourth time. Or get the laundry into the dryer before it needs to be washed…for the the third time. The world needs women caught on fire. Not women competing with each other. Not women judging each other. Not women beating each other down with negativity. But what if I’m sitting here feeling like a stick of damp kindling? How will I ever catch on fire? Let me tell you, it’s much easier to catch that little stick on fire if you toss it in a campfire than to sit there and rub two little sticks together hoping to make a spark. It’s time to seek these campfires. And in a world of rain, that’s hard. The negativity on places like Facebook and the comments sections on blogs, mixed with the self-doubt caused by the highlight reels and perfect lives we see on Pinterest. They douse our tiny little flames. But if we come together, all our little flames can build a roaring bonfire where we welcome other women into our warmth. Where we can encourage and empower each other. Where we find, chase and achieve those dreams we might not even know we have. Bring your brave. Tell your story. Maybe I do have a dream after all. (And any dream is worth sharing.) Maybe my dream is to encourage and empower women, in the hopes that somewhere in our little campfire is a woman who dreams of ending childhood hunger, curing cancer…or inventing the dryer that folds your clothes, too. Let’s help each other catch fire. Let’s be brave. Let’s support each other; share our talents, skills, and wisdom; let’s be real. If you’re looking for a campfire, join our community here: Simplify Healthy Living (Facebook Group). « Holiday Survival Guide 2014 – Time For a Little Fun! Dani, thank you for not succumbing to the self doubt you were feeling and for taking the time to sit down and write these beautiful words! You are a champion! And your words were truly inspiring. Thank you for reminding me how much we all really NEED EACH OTHER! It’s so true. We can’t go these roads alone, whether great or small. Sending hugs, gratitude, and well wishes to you! Sometimes it does seem as though women beat each other down rather than trying to lift each other up. Stay-at-home-moms are awful for not working, working moms are terrible for not being at home, Susan doesn’t keep a perfect house and Betty can’t stay in a relationship and and and….I hate it. On another note I am surprised you can even find time to blog so kudos to you!